Welcome to another edition of our theme roundup my fellow theme addicts. I hope all the BlackBerry Moms out there had a great weekend. As a belated Mother's Day gift I've included an extra selection so that you can thank your Mom for everything she does each and every day of the year. If you're looking for a lively and colorful theme and don't suffer from a fear of bugs then be sure to check out Little buggies Stick Black Wood by TMK. This cute little theme is just the thing to brighten up your mood with its eye-popping insect icon set and wooden wall backgrounds. If you think you can view your display without grabbing a can of bug spray then head on over to BlackBerry App World and pick this up for $1.99. It's compatible with BlackBerry 8520/30, 8900, 9220, 9300/30/60/80, 9500/20/30/50, 9630/50, 9700/80, 9800/10/50/60, and 9900. I couldn't help but include this Mother's Day theme by Value Apps to pay tribute to all the mothers of the world. This theme represents the love a mother has for her children and how she stands tall facing the world to protect them and watch them grow. This simple and solid theme offers a custom home screen layout and warm background to showcase the confidence and strong bond we all share with our mothers. Mother's Day-Sunrise is compatible with BlackBerry 8520/30, 9300/30, 9630/50, 9700/80/88, and 9800. It's available in BlackBerry App World for $.99. (This theme is not OS7 compatible). Blue Magic by OMinor gives your device's display a little lift with its visually appealing design. Featuring electric blue backgrounds and an awesome custom icon set this is a simple yet effective theme that runs smoothly with no lag or battery drain. Best of all you get this well-designed theme for $.99 from BlackBerry App World. Blue Magic is available for BlackBerry 8520/30, 9220, 9300/20/30/60/80, 9650, 9700/80, 9800/10/50/60 and 9900. Elecite continues to amaze us with their latest design simply titled Glare Bottom Dock. This professional and clean looking theme offers a clutter free experience and brightens up your display with those vivid and beautiful icons. 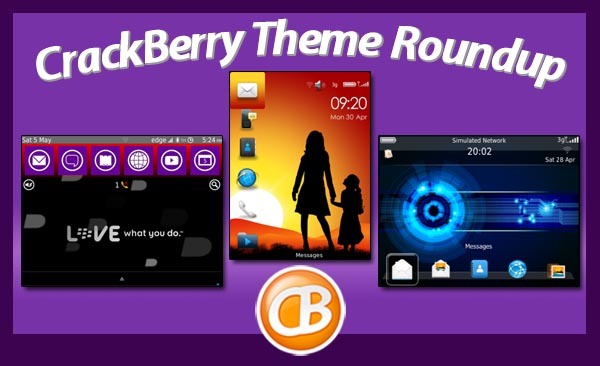 If you're a BlackBerry Bold 9900/30 owner and looking for a theme to showcase all your favorite wallpapers and still offer the level of customization we all expect then be sure to check this out. Glare Bottom Dock is available from BlackBerry App World for $6.99. drkapprenticeDESIGNS have decided to up the ante again and dazzle us with their latest release Mo7.1 which is their popular Mo7 theme ported to OS7 devices. The result is an impressive Windows Phone replica theme that lets you access all of your most used apps at your fingertips, show off your favorite wallpapers with amazing animation that hides the dock, and is 10 different themes in one by using the hotkeys to change the color to suit your mood. Mo7.1 offers complete font customization in the menus and messages list and has skinned every possible icon to give you a great UI experience. You can pick up your own copy at the links below for only $2.99. For now it's only compatible with the BlackBerry Bold 99xx and Torch 9810. However, he's currently working on making it available for other devices.